Volkswagen Group's supervisory board and U.S. officials are set to sign off on a $4.3 billion settlement of U.S. criminal and civil penalties for rigging diesel-powered cars to cheat on emissions tests, the latest step in the carmaker’s effort to resolve the scandal. The agreement with the U.S. Department of Justice and customs authorities will include a guilty plea, VW said Tuesday. The automaker's supervisory board was meeting Wednesday to review the agreement. U.S. officials are holding a press conference Wednesday afternoon local time in Washington to announce the settlement. The accord raises the committed cost of settlements in the scandal so far to more than $23 billion in the U.S. and Canada, blowing through the $19.2 billion the carmaker had set aside to resolve the disputes. At the same time, it would remove one of the last big regulatory obstacles for Volkswagen before the Jan. 20 inauguration of Donald Trump as U.S. president, enabling the carmaker to begin rebuilding its reputation in the country and focus on plans for clean-energy vehicles. “Although the settlement is higher than reports had indicated, we view the resolution as a positive catalyst for Volkswagen since it removes the final known major liability” from the diesel scandal, even with other legal issues pending, analysts at Goldman Sachs, including Stefan Burgstaller in London, said in a report to clients. U.S. courts must still approve the settlement. 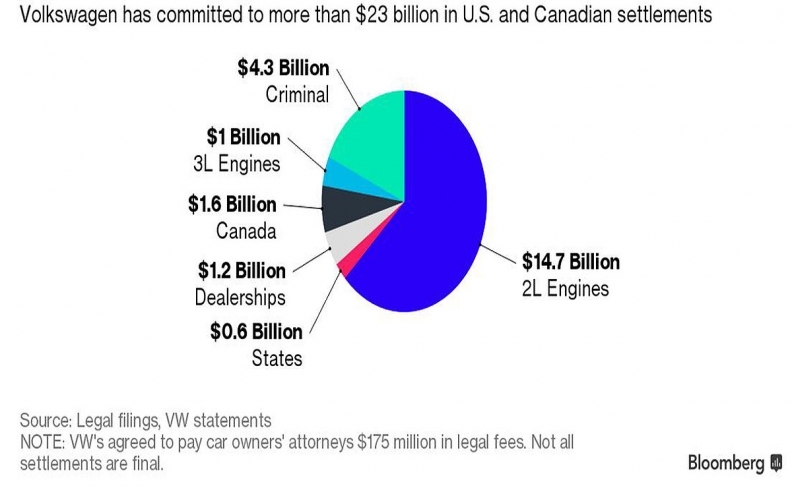 VW also is involved in investor lawsuits in the U.S. and in Germany related to how the emissions-test rigging affected the stock price, as well as consumer lawsuits and a criminal probe in Germany. Concluding those disputes will be important as CEO Matthias Mueller seeks financial resources to shift the carmaker -- which almost certainly overtook Toyota Motor Corp. as the world’s biggest last year -- to new technology including electric powering systems and automated driving. That strategy will cost more than $10.5 billion in investments by 2025, the company said in June. At least one employee is facing charges in the U.S. and another has already pleaded guilty related to the scheme. U.S. prosecutors are planning to charge high-level VW executives based in Germany, a person familiar with the matter said. The draft settlement calls for strengthening compliance systems and installing an independent monitor for three years, Volkswagen said in the statement. The company didn’t say in its statement whether additional individuals would be charged or plead guilty. The Justice Department declined to comment. U.S. authorities uncovered the carmaker’s efforts to deliberately cheat on emissions tests on diesel vehicles in 2015. The rigged engines had been installed in 11 million vehicles worldwide, and cost former CEO Martin Winterkorn his job. The carmaker, which plans to post a provision in the fourth quarter of 2016, has the resources to absorb the costs. The company had net liquidity of $32.6 billion in the automotive division at the end of the third quarter, and extended a $21 billion bridge loan facility through mid-2017 to provide an additional financial cushion and protect its credit rating. Volkswagen’s 2016 financial performance will be hurt by the settlement, Porsche Automobil Holding SE, the investment vehicle of the Porsche and Piech billionaire families that controls 52 percent of VW’s voting stock, said in a statement on Tuesday. VW engineer James Liang pleaded guilty in September in U.S. federal court in Detroit to conspiring to defraud U.S. regulators and consumers. Liang, who was involved in creating a defeat device so cars with 2.0-liter diesel engine could pass emissions tests, is scheduled to be sentenced May 3 and faces as long as five years in prison. He’s cooperating with prosecutors. Oliver Schmidt, the company’s liaison with U.S. environmental regulators, was arrested Saturday in Florida and is scheduled to appear in court there again Thursday. The 16-month saga could still have further to run, with U.S. authorities investigating who was individually responsible for the cheating and VW facing probes and lawsuits in Europe and elsewhere. 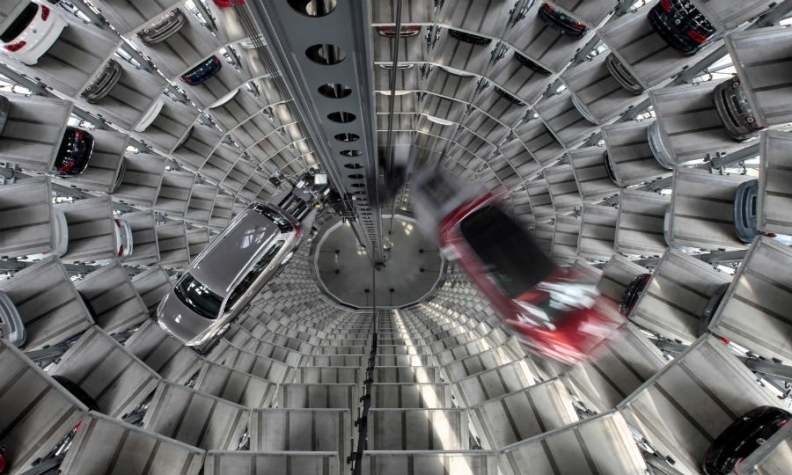 "This is a partial victory, but VW is by no means out of the woods yet," said Ingo Speich, a fund manager at Union Investment which holds about 0.6 percent of VW preference shares. "There are still considerable litigation risks." "Facts need to be revealed now and, if necessary, further steps need to be taken regarding individuals to regain the trust of capital markets," Speich said. Most analysts had expected the U.S. settlement, which VW has raced to conclude before the Obama administration bows out on Jan. 20, to cost the carmaker around 3 billion euros. Erik Bomans, a managing partner at Deminor which is working with some investors on a claim against VW, said those responsible for the scandal had to be brought to justice. "What we hope is that there has not been a trade-off in the discussions between Volkswagen and the U.S. Department of Justice, a trade-off that could be 'we as a company plead guilty and we are willing to pay a big fine, but in exchange for that, you, Department of Justice, you allow us ... not to mention anything about the personal involvement of certain key, senior managers of the company'," he said. Greg Archer, director of clean vehicles at green campaigners Transport and Environment, said VW's admission of criminal misconduct in the U.S. was unlikely to have implications for lawsuits in Europe, where a loophole in the regulations has effectively allowed automakers to routinely exceed official emissions limits. The European Commission in December began legal action against Germany, Britain and five other EU member states for failing to police emissions test cheating. "They are ineffective and they are in urgent need of reform," Archer said of the national regulators responsible for approving new vehicles in the EU.